In 2015 it was reported that Amish were moving to Vermont, to the area of Orleans County, part of a region known as the Northeast Kingdom. BROWNINGTON — The yellow street signs showing a horse-drawn Amish buggy near the Old Stone House Museum are not to alert drivers to the historical museum up ahead, but to the fact the dirt roads in this rural northern Vermont town are now frequently traveled by new Amish residents in the community. Beginning in 2015, a handful of Amish families from Pennsylvania began purchasing farmland, homes and barns. The Brownington Parochial School began recently and children can be seen walking to and from the school. Before the school was opened this year, the Amish families had been home-schooling their children, said Lovina Miller, who moved to Brownington with her husband, Levi, and their family. 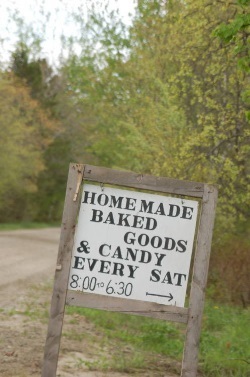 The Millers run a baked goods stand at their farm on School House Road near Route 5A on Saturdays, and across the stand, they have a small building that houses hand-made quilts, pot holders, furniture, maple syrup and other goods the family sells. The family moved here from Albion, Pennsylvania, and are Pennsylvania Dutch, she said. It’s a nice update which discusses things like why they came (land prices, liked the area), their school (“We will meet state and federal regs that do not object to our religious beliefs” they wrote in their application), and a “monthly Amish dinner” held at the local Old Stone Museum. Maclure recalled one day getting a phone call about 4 p.m. on a cold December day. “The first group I met with that ended up in Brownington, they had hired a driver with a van. They called me and they were in St. Johnsbury, about 4 p.m.,” said Maclure. Maclure agreed to meet them closer to his farm in Barton, at a gas station in Orleans, and they hoped to pitch tents on his land and sleep in sleeping bags, they told him when he asked where they planned to stay. A realtor for 34 years, Maclure had never encountered anything like this situation. He wasn’t sure if someone had found the farm in Brownington on the internet and shared it with the Amish family or just how they came to know of farms being available in the NEK, Maclure said. Maclure said, “It was supposed to be 10 degrees,” that night, and he couldn’t let them sleep in tents. They asked if he had a barn. “I think I gained their trust by helping them,” said Maclure. Amish do not make friends with “English” people. They use, employ and when need to, act in such a way that “English” interrupt that the Amish are considering a friendship with them. Amish when in the company of other Amish will not treat any “English” as a friend. That is a known fact from anyone who has been exploited be the Amish. Eve, I know many English and Amish who would disagree with your statements, myself included. I’m sorry if something bad happened to you on an individual level. But if you’re trying to stir up trouble here, please take it somewhere else. I had the welcoming friendship of two Amish gentlemen who thought it was strange that a Englishman could speak Pennsylvania Dutch and not be Amish. I can also speak German to. I’m fortunate to be able to state that I have good women friend’s that are Amish. I have not “lived” in their homes, but rather in several cases a cottage on the same premises as their homes/farms. They’re kind and hospitable, and always. respectful. The Christian Farm Community women gather to sew and socialize and here great talking and laughter takes place. We look forward to shopping, and I’m one of the drivers. In the car, we laugh till we cry over fun stories and things that have happened during the course of the week. I’m never “used” either – particualrly among the Amish who are extremely generous. If I drive or do some “kindness”, I will find a beautiful, white cotton, modest handmade nightgown draped over a chair by my bed, or a homemade apron hanging on my coat rack. Several weeks ago, a Mennonite teen was “concerned” for my hands, and crafted me a pair of half finger gloves from leather, so I could grip better the reins on a feisty draft gelding. The last dozen years working within these Christian Farm Communities has enriched me beyond any expectations. I have seen the Amish restore old, left for ruins farms, barns, and farmhouses – work around the clock and beyond, and bring life back to depressed areas in Central New York and the North Country, when others had no hope and thought it was plain impossible! Moreover, incumbent farmers embraced the Amish particularly, and worked side-by-side on many joint projects. At the end of the day, all here go to their own homes, and give each other the space and privacy to be among their individual culture and practice their own religion and beliefs. Having said that, there are areas that are less harmonious, dealing with a myriad of conflicting issues within their specific culture and religion, as well as external situations concerning laws, dairy farming regulations, and unresolved matters that have some picking up and leaving altogether. Nothing is certain, and life can be challenging here. But, I can state I’m blessed with having good friends, most of them women, consisting of mostly Baptists, Mennonites, and Amish!. Sounds like you have some great friendships there, Maureen. And a realistic view on the Amish as a whole. Thanks for sharing this. eric; my contribution was not intended to “stir” up trouble. I have been blessed to encounter and join in “fellowships” with a variety of amish people. To believe that only positive encounters happen with the amish communities is naïve and misleading on your part. not every one has a pair of rose colored glasses they wear when they are in the company of the amish. Eve, I would hold off on calling anyone naïve 😀 Sounds like you might be new here. It might be helpful if you can point out where I suggested “that only positive encounters happen with the amish communities”, as you put it. Below, some recent posts where you’ll find that the Amish are not painted with rose-colored glasses, but rather as humans with their own problems and flaws. I like the Amish on the whole, and have Amish friends. But I recognize they are human and hardly perfect, and that can lead to conflict both in their communities and with non-Amish. …then I have to call that out as extreme in the opposite direction. You answered this very well Erik. I think you do a good job of showing both sides of the Amish — the good and the bad. Reality is reality. Eve’s statements the Amish do not make friends with English people is false and hurtful to the many Amish and English people who ARE good friends. I have no idea what happened to Eve to make her say this, but I am glad you called it out as a “broad all-inclusive” statement. I’ve personally had a few bad experiences with people who weren’t Amish — but I cannot fairly say ALL English people are bad or do not make friends or whatever. Let’s be fair and reasonable here. Hi, I’m new to these posts. Listening to both Eric and Amish talk about people in general concerning ones belief. It all comes down to what God has for his PEOPLE, Matthew 7:1 and 7:2. Thanks John, belatedly. Good verses. Interesting John, I think it is probably a similar story to upstate NY, with farming falling out of favor among the current generation and Amish seizing an opportunity to get land at a reasonable price. Don’t know how VT land would compare with parts of NY but maybe we’ll see more Amish head in that direction (or NH as well). Flip Phones &amp; Smart Phones. Flip Phone, much less Smart Phones. The point I’m making is: for actual 9-11 Emergency only. Not for Chet chats & so on. Eric; we, obviously live in a vilolant world. & haven’t improved much. you’re the young guy that know & have meet some loyal, kind Amish People that became your friends. Still people are set in their ways. Are their any changes that the Amish could be convinced to have a flu phone in the Teachers Desk, yet, occasionally, it’ll need charging. It’s common sense, the News Media are the types by changing the story. Therefore: your feedback would be appreciated. I have not yet met the Amish people who came to Vermont, but I am glad they chose to do so. I have worked with a number of farmers in the Northeast Kingdom, and the younger generation has little interest in continuing the farming tradition. The work is simply too hard, and the alternatives too attractive. I have watched many farmers sell their herds, break up their farms, some of them file for bankruptcy, and their families scatter. The Amish have kept the old traditions and know that hard work is good for the soul. They have not invited TV’s into their homes; their families are close, and they support one another. They fear God, and follow his Commandments. One could not ask for better neighbors. The hill country of Vermont is a difficult place to make a living– there is a reason so many Vermonters left Vermont in the 1800’s and moved to the more fertile, richer soils of the Ohio valley and Midwest. But there are natural benefits here, too, and I pray that the Amish will thrive and come to love this corner of northern New England. Thanks for your comment James – good to hear from someone who knows the area well. I’ve seen the photos and the area looks beautiful but I can imagine the farming might be tougher. If you get a chance to visit the Amish in the NE Kingdom, let us know!